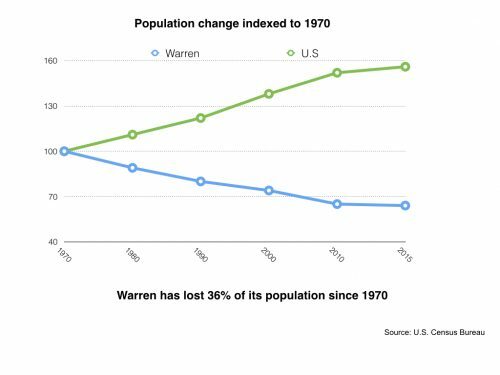 Any discussion of Warren’s demographics has to begin with the severe drop in population we have experienced since 1970. The chart to the right show both Warren’s population, and the population of the United States, expressed as an index over time. Both have an index of 100 for the year 1970 when Warren’s population was about 63,500. By 2015 our population had dropped to 40,700 — a loss of 36% in 45 years. Warren was hardly alone in suffering such a population loss, especially among Midwestern, industrial cities. Detroit lost more than half of its population in the same period, as did nearby Youngstown. But their worse misfortune doesn’t help us. The point is that every one of those 23,000 who used to live here, but no longer do, represents a job that no longer exists, taxes no longer paid, a house with no occupant, a store with fewer shoppers, a town with less talent and energy. Some will say, “well, a lot of those people just moved to Howland or Cortland or Champion.” And they are correct, but many of them took their business or their law or medical practice with them; which means they no longer pay taxes here and have even less reason to shop here. That’s money lost to pay for government services. Unfortunately, the government services don’t necessarily shrink in proportion to the population. We have 185 miles of city streets that must be paved, plowed and patrolled, just as we did 50 years ago. The WPD and the WFD must cover the same geography as they did back in the day. Unfortunately the pace of population change has not lessened. Warren loses about 10 people per week; that’s 500 people per year or more than 1% of the total population. And as the U.S. continues to grow, we look smaller and smaller to both the State and Federal governments, and become less likely to receive help. In fact Warren is already too small to receive traditional HUD-CDBG grants but is grandfathered into the program for about $1.5 million per year, although the first Trump budget may eliminate the program altogether. Next up: Our aging population. Posted Wednesday, March 15th, 2017 under Economic development.